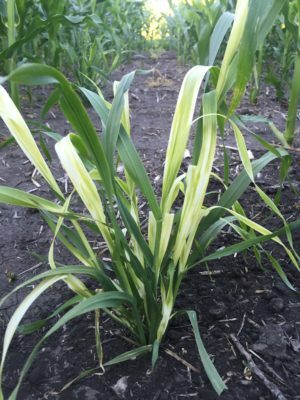 It’s the time of the year to assess weed control in your corn fields. The corn plant, with its lush and tall growth can trick us into thinking our weed control was excellent from afar. However, when you get up close and scout your fields after applications and well into the season that might not be the case. I want to emphasis attention to weed control at the V6-V10 growth stage that most producers are at this week. If you have one last post application to make, ensure you know what weeds are present in your field through proper scouting and make applications that will take out those weeds. A great well-known reference that most know of is the NDSU Extension Weed Control Guide (https://www.ag.ndsu.edu/weeds/weed-control-guides/nd-weed-control-guide-1). Make sure that your problem weeds will be controlled by your last herbicide choice. If you are all finished with weed control and your crop is progressing to growth stages where weed control is not labeled or recommended due to the canopied crop, it is a good time to scout your field for how your pre and post applications faired before the corn crop gets any taller. I scouted a field last night and found escaped wild oat and barnyard grass that missed our second application of the herbicide Laudis in a conventional corn trial. I know it is not always possible, but rouging weeds like I did with the wild oats can save you so much trouble in future years. Wild oats bleached but not controlled by Laudis at 3 fl. oz. Scout fields for any escapes! An immediate worry in much of the corn growing region, especially SE ND, is waterhemp flushes with mid-season rains. Waterhemp is a warm season weed, meaning that it thrives in warm soil and air temperatures, and can grow at an alarming rate. A canopied corn crop will reduce waterhemp survival during late flushes, but do not assume all the waterhemp will not make it through. Especially where you have a poor stand, keep an eye on late waterhemp flushes and consider zero weed tolerance to avoid the up to 1 million seeds produced per waterhemp plant. All in all, as weed control programs are getting more complex to take care of the myriad of weed issues we have in today’s production systems, use this period of the growing season to assess your weed control, consider zero weed tolerance of waterhemp and other problematic weeds, and make your herbicide management program even better for next year with this year’s observations.